Fifty-four years after James Baldwin’s The Fire Next Time revolutionized the way we talk about race, it still feels eerily present. Taken out of historical context, Baldwin’s words read like they were written yesterday, not published in The New Yorker more than five decades ago. At the time, Down at the Cross: Letter from a Region in My Mind was so impactful that after the essay was published, photojournalist Steve Schapiro, who often shot for Life magazine, persuaded his employer to run a full profile of Baldwin. The assignment led to Schapiro shooting some of the most iconic images of his long and legendary career, including one of a young, then relatively unknown Martin Luther King Jr. 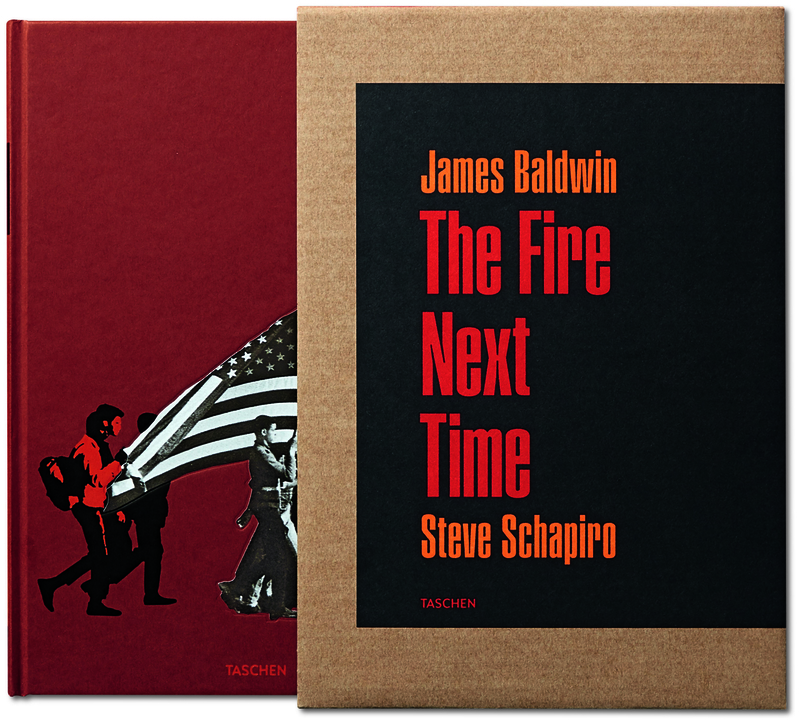 These images, many of them never before published, are featured alongside Baldwin’s words in a new limited edition letterpress edition of The Fire Next Time, released by art book publisher Taschen. There are 1,963 first-edition volumes — a nod to the original publication year — and this rerelease of The Fire Next Time is the third in a literary letterpress series that combines iconic works of nonfiction with the work of acclaimed image-makers. Nina Wiener, Taschen managing editor and lead on the Baldwin project, noted that the series is ongoing. The two other books in the series reimagine Gay Talese’s 1966 Esquire story Frank Sinatra Has A Cold coupled with photographs by Phil Stern, and Tom Wolfe’s 1968 The Electric Kool-Aid Acid Test alongside photo-essays by Lawrence Schiller (who conceived the idea to include Baldwin in this series) and Ted Streshinsky. The Baldwin volume is a silk screen hardcover with an embossed case and is letterpress printed on two different stocks of natural uncoated paper. It’s 272 pages and retails for $200. Most of Taschen’s collector’s editions, said Wiener, are “very large, very heavy and very expensive,” but Wiener’s team — composed of Lawrence Schiller, art director Josh Baker, designer Jessica Sappenfield and captioner Marcia Davis — decided to create The Fire Next Time on a more intimate scale. It’s smaller and designed in such a way to encourage the reader to actually, well, read. “We thought it was extremely important,” said Wiener, “that we had the captions written by someone with a strong knowledge of the history of the civil rights movement — but who could also connect it to the events of today. Marcia Davis, a longtime editor with The Washington Post, worked with us on the captions.” Wiener noted that Davis was a leading editor on The Washington Post’s Ferguson coverage and that her work has included social justice issues for the last 20-plus years. “She’s just fantastic … and she managed some pretty relevant stories in very short word count that the captions allowed for — an art unto itself. She was a critical part of making this book work.” This is not your average coffee-table book. Because of Schapiro’s desire to cover Baldwin in his element, he traveled to the South with him and ended up documenting, although Schapiro didn’t quite grasp the magnitude of it at the time, the beginnings of the civil rights movement. John Lewis, Medgar Evers, Fannie Lou Hamer, Alabama Gov. George Wallace, the Freedom Riders and members of the Student Nonviolent Coordinating Committee, key players in the battle for civil rights, were captured in Schapiro’s resolute search for authenticity. Besides Baldwin’s words and Schapiro’s photographs, this new edition features an introduction by activist U.S. Rep. John Lewis and a note from Baldwin’s sister (and executor of his estate) Gloria Karefa-Smart. Because of its intimacy, this is a book that we can open to learn from, and to find glimmers of hope in, for a long time to come. Tierra R. Wilkins is an associate editor for The Undefeated. She likes to eat fries with her ketchup.